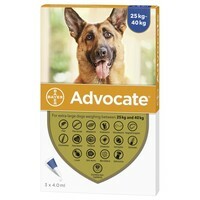 Advocate Extra Large Dogs, for dogs larger than 25Kg (Advocate 400) contains 4.0 ml (400 mg imidacloprid, 100 mg moxidectin)and is a broad spectrum combination treatment, effective against fleas, flea larvae, roundworms, hookworms, whipworms, heartworms and Sarcoptic mange, ear and Demodex mites. Advocate Extra Large Dog gives you proven flea and flea larvae control as well as effective control of intestinal nematodes, heartworm and mites. No problems with fleas & a bonus that certain worms are also dealt with. Excellent product,as described,fast delivery and excellent communication. My large breed have been using Advocate since day one. Got prescription from our vet to buy from VetUK for the last two years with no issue at all. Fast delivery and reliable service. My dog had mange and this got rid of it and helps to prevent it reoccuring. Great stuff. I was recommended to use these by somebody who had lost his adored young dog to lungworm. The horrible disease developed quickly and was fatal. He urged me to use Advocate for my mongrel. This dog, despite noshing every ancient half-chewed burger he finds and following it up with a chaser of Thames water, has not so far infected himself with anything and I think he has Advocate to thank. Recommended by the vet over Frontline, kind on our Greyhound's tummy, and has kept fleas at bay so far. Easy to apply and a very good price. I have just tried Advocate on my 2 greyhounds one of which has FAD after neither Frontline or Effipro seemed to get rid of the fleas. I'm not sure whether the fleas have become resistant to the active ingredient in the other 2 products (Fipronil) but Advocate has done the trick. I would recommend trying Advocate if you aren't having much success with other flea treatments.